I have received news today that Kool Korners is gone. 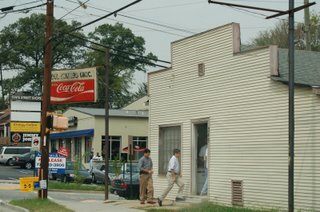 After years of loyal service of jalapeño-covered roast pork goodness to the Georgia Tech and Midtown communities, the fantastic eatery with the dull white siding and red Coca-Cola sign on the corner of 14th and State in Midtown Atlanta has closed for good. A single tear rolls down my cheek as I remember all the wonderful times I had in, around, near, or because of Kool Korners. A small, cramped store (which used to remind me of the “bodega” bit in Half Baked) with dusty products on the shelf, the line for ordering a sandwich used to go out the door and around the side of the store if you happened to get there between 12:00 pm and 1:00 pm. Cosmetically, it was probably the ugliest, most run-down place to receive a 5-star rating from the Atlanta Journal-Constitution in their Access Atlanta website. I will forever miss having a Cuban sandwich with Platanutres and Malta India in the company of my main man Ildefonso and his loyal contingent of sandwich-flippers. Three cheers for the memory of this fantastic establishment. It will be missed by all. Update: As a tribute to the former five-star eatery, I’ve posted the smash rap-comedy hit by the Kool Kornerz Lokoz, The Low End. Click here to download. Long live the Cuban sandwich! This entry was posted on August 1, 2008 at 6:18 pm and is filed under Atlanta, On My Radar, Sad. You can follow any responses to this entry through the RSS 2.0 feed. You can leave a response, or trackback from your own site. They moved!!!!!! They are now in Birmingham, AL and are still just as good!